Location: Chicopee, Massachusetts about 10 miles northeast of Springfield. 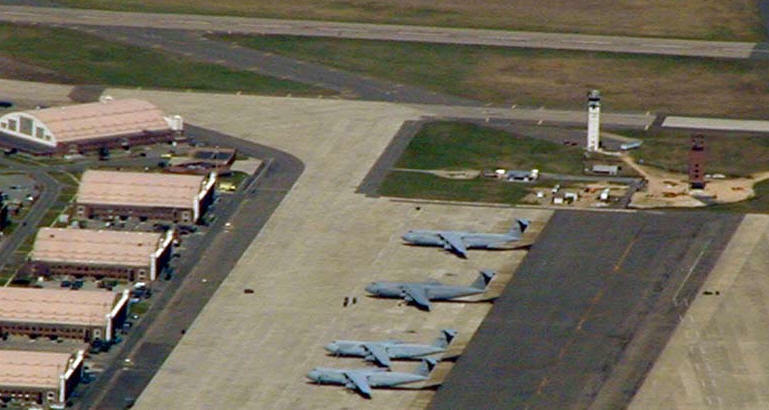 Westover is the largest Air Force Reserve base in the United States. Located on approximately 2500 acres of land within the communities of Chicopee and Ludlow, Westover resides within the Silvio O. Conte National Fish and Wildlife Refuge which covers the entire Connecticut River Valley. Westover is home to the 439 Airlift Wing operating and maintaining 16 C-5A Galaxy Aircraft, representing five percent of United States airlift capabilities. The 337th Airlift Squadron is the Wing's flying unit. Westover ARB is home to reserve personnel who train one week-end per month as well as a 15-day annual tour. The base provides worldwide air movement of troops, supplies, equipment and medical patients. In addition, the Westover ARB personnel provide airdrop and combat off-load operations. Peacetime mission includes recruiting, training and supervision of personnel to ensure mission readiness. The base�s 2-mile long main runway is an alternative landing site for the space shuttle. President Roosevelt signed a $750,000 Works Progress Administration (WPA) project bill for the air base's construction in November 1939. Fourteen hundred WEA and Civilian Conservation Commission (CCC) workers cleared the land, and actual construction was started in February 1940. The Quartermaster Corps proved to be -unequal to the gigantic task of rapidly designing and building hundreds of military installations across the country, so to ease their burden, the Corps of Engineers was given all Army Air Corps work in November of 1940. Since the Constructing Quartermaster had already planned the base, the first permanent masonry buildings were constructed to those designs, which were intended to be lasting and attractive. In fact, it is these buildings which have survived, while of the hundreds of temporary buildings later constructed to meet the tremendous needs of the war mobilization by the Corps of Engineers only a few remain. On April 6, 1940, "Army Day" nationwide, the dedication, flag raising and ground breaking ceremony was held on site. The new air base was named for Major General Oscar Westover, Chief of the Air Corps, US Army, who had died piloting his own plane in September 1939. Building at the base was constant throughout 1941. At first, the base had been planned to accommodate 1,400 men as an airplane overhaul facility, but by 1940 this had been increased to 3,000 men. At the start of 1942 there was housing for approximately 3,300 enlisted and 500 officers, and at the close of that year there were quarters for about 8,000 officers and men. All but a few of these temporary buildings are now gone. The first organization at the base was the 10th Signal Platoon that began working in June 1940. The first Air Corps arrived in July. Throughout 1941 many organizations passed through being activated and deactivated. For a brief time the all-black 369th Antiaircraft Coast Artillery Regiment, known as "Harlem's Finest" was stationed here. In 1942 Westover Field became the training center for anti-submarine, engineering, chemical platoons, bomber and fighter groups. The following year training mainly focused on fighter groups and anti-submarine combat units, and in the fall of 1943 the base's main mission shifted from fighter training to training heavy bomb groups. SAC operations began at Westover in 1955 and the 1959 "mole hole," building 7450, was the first building erected as part of the SAC massive retaliation strategy. Here was where long-range B-52 bombers armed with nuclear devices were kept on continuous alert on a nearby runway, known as the Christmas Tree. Their crews rotated through the mole hole, spending one week of 24-hour alert in underground quarters going everywhere together during that week so they were always ready for launch in a few moments. The lower control room was outfitted for SAC operations in case of nuclear war. 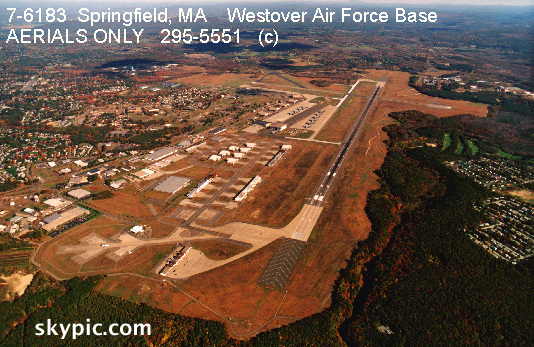 Since 19 May 1974 Westover has been an Air Force Reserve Base. From that time until October, 1987 the 439th Tactical Airlift Wing operated C-130 Hercules and C-123 Provider aircraft. The wing converted to C-5s in 1987 and the unit eventually became designated as the 439th Airlift Wing. Westover continues to operate as the world's largest Air Reserve Base and as Tactical Wing, and is one of the country's two centers for Galaxy C-5A military transport aircraft. Between March and July of 1991, soldiers returning from the Gulf War landed at Westover where they were met by their families and friends. The 99th Bombardment Wing (H) flew out of Westover AFB, MA from 1956 through 1974.